The Financial Driver of Tiger Woods. Researchers at University California Davis studied the impact of the Tiger scandal on shareholder value and concluded that the Tiger-endorsed brands collectively lost between $5 and $12 billion in the two weeks following the wake of the extramarital affairs. More specifically, share values (and market caps) of public companies endorsed by Tiger including Accenture, AT&T, Electronic Arts, P&G (Gillette), Nike, Pepsi (Gatorade) and TLC Laser Eye Centers fell over 2% of value with the news. I am not going to comment on the authors' methodology or if they normalized the stocks values over the two week period, but I will say that I tracked Nike's BrandMojo.org ratings over the same weeks following the scandal. Nike's overall average score decreased along with its overall ranking and the proportion of "1" ratings increased. 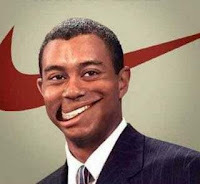 Using the logic of Till and Shimp, the brand most closely related to the tarnished endorser will suffer the most- and this is precisely the case with Nike. A 4.5% drop in shareholder value and a changing image of it customers. Ouch. We'll see how long these drops last.